Tea with my mom (Grandmommie to my kids) is a longstanding tradition. We tool a few DVDs with us to watch while we were on vacation, but found out there was no DVD player. Grandmommie to the rescue! We watched The King's Speech on her laptop, leaning on piles of pillows in bed. 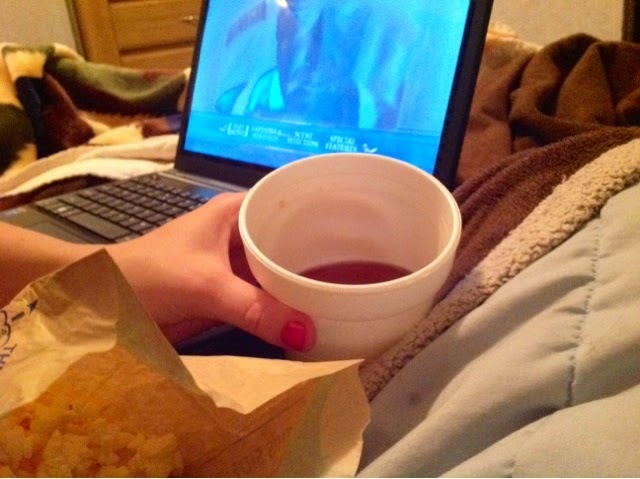 Hot Herbal Tea , popcorn, and pillows transformed the room into a theater. Sort of. I loved my mom's comments throughout the movie. "His wife is so supportive." And again.., "I love how she stands by her man." Her words echo my feelings about the wife in another semi factual movie A Beautiful Mind . "Darling" his wife says, giving him her complete support. His wife the new Queen "I'm sure you'll be splendid." followed shortly after his successful speech by a gentle "I knew" and then she kissed him. Funny, looking back, one of the highlights of our vacation, to me, was listening to my mom as my girls and I watched a movie with her, snuggled together in her bed with our styrofoam cups of hot tea.